There is couple of great tutorials over the internet which you can try before this. I have created couple of feature request for Epic so it will be simpler to create such inventory. 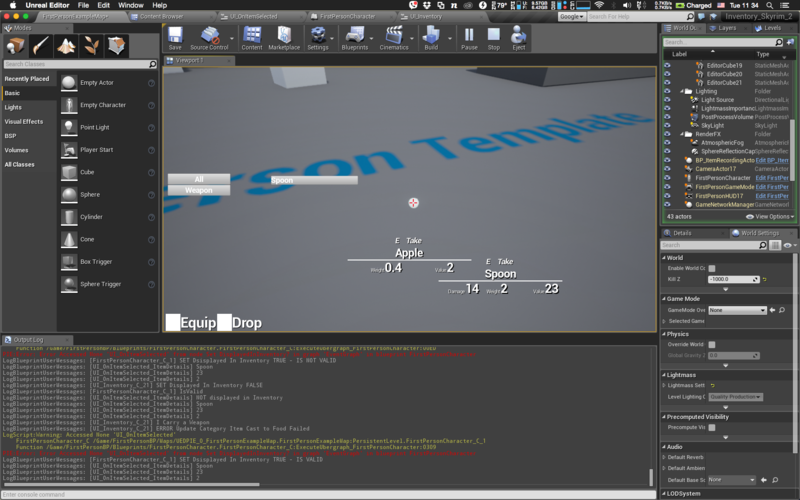 Open your 4.10 Editor and create new blank project from First Person Blueprint Template. Let me drive you trough basic architecture. Items will be object oriented and will use Objects instead of Actors. Let’s create first base Object for items. ID Text Especial ID for the item. It is text to be able to better search later. There shouldn’t be two the same items with the same ID! Name Text Name of the Item – it can be “Shield” or “Dagger” whatever you like. This will be showed in UI. Value int Value of the item. Weight float Weight of the item. WorldMesh StaticMesh Reference Reference to the static mesh that will be graphics representation of the item. Thanks to that we will know which static mesh should be assigned later. And that’s all for now. It will be base class for all of the items. It doesn’t have any damage, armor rating variables. In Skyrim some types of items have dedicated variables such as damage, armor rating or special effects. To have the system more generic each new item category (armor, weapon, misc, ingredient etc) will extend from Item class. ArmorRating float This will be armor rating for armor type item. USEFUL TIP: This is the place where you can add equip type, mount type to the object . I won’t do this because it’s not in the scope of this tutorial. I won’t be equipping items to hands or body. Create another Blueprint extending from item named Item_Weapon. Damage float Damage for the weapon. This is the place where you can add equip type, mount type to the object . I won’t do this because it’s not in the scope of this tutorial. I won’t be equipping items to hands or body. They do not have any custom variables. If Item is Object how to add it to level? Yes, Objects can’t be placed into world. They are just data blueprints which aren’t generating any draw calls. That’s why I will create an Actor that will have reference to Item object. 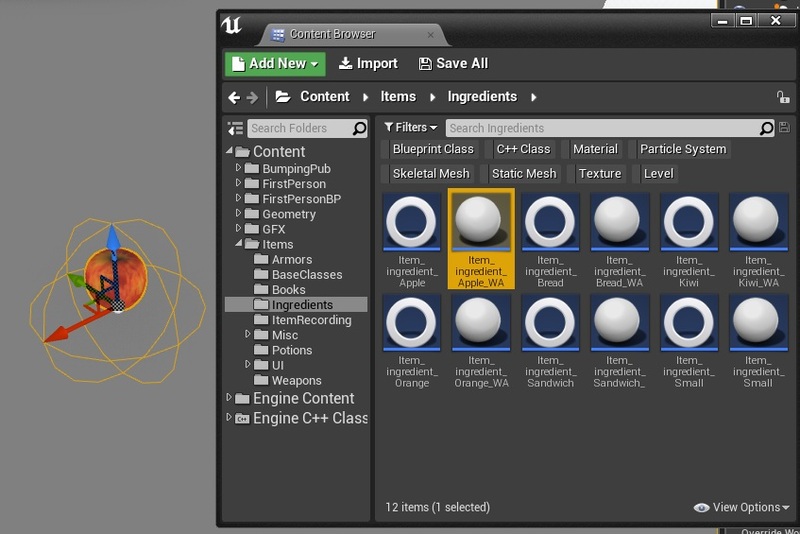 Sphere Collision Component named Sphere. Attached to Root. Item Item Object Class Storing link to the Item object. Used to create object. Expose on Spawn: True! Editable: True! ItemReference Item Object Reference This will be referencing to created object from Item. Reference here means specific created Item. bEnablePhysics bool Expose On Spawn: True! Editable: True! Find some Apple mesh. Create new blueprint extending from Item_Ingredient named Item_Ingredient_Apple make sure you have assigned WorldMesh to your Apple mesh. Then create new blueprint extending from ItemWorldActor named Item_Ingredient_Apple_WA. (WA here means World Actor) Open it and assign Item_Ingredient_Apple object to Item variable. Place the Actor in level and you should see Apple. At this point nothing will happen with the item but you should get the idea here. It would be much more simpler to generate those WA actors from Objects, but we don’t have possibility to create new data types in content browser from Blueprints. 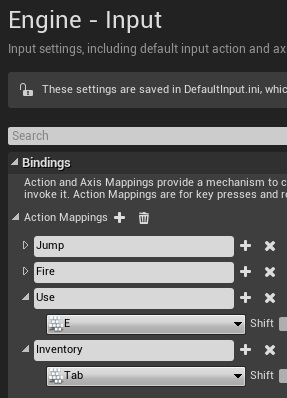 Another thing are thumbnails – UE4 is missing simple “Capture Thumbnail” in current component stage (after changing something in Construction Script) – without thumbnails it’s hard to find the items. We need a place to store inventory items somewhere. I will use Actor Components for this at it can be attached to any actor. Count Int How many Items do we have. Item Item Object Reference Reference to the item. 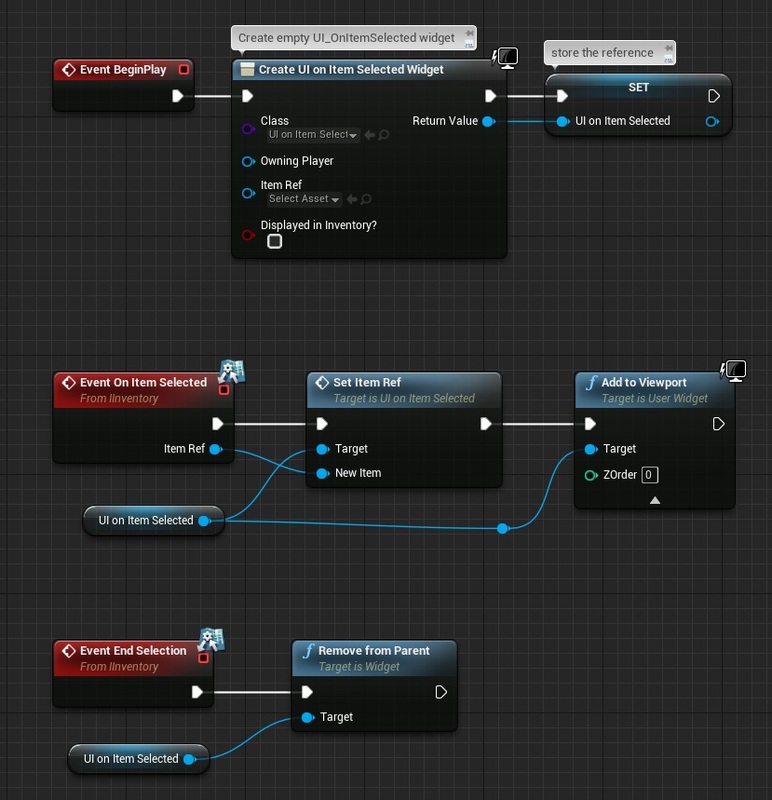 Now create new blueprint extending from Actor Component named Inventory. So you have the idea how the basics classes will work but what about communication? I will be using Interfaces to communicate from one blueprint to another. There will be two Interfaces one for UI (UMG) communication and one for in-game communication. This ENUM will be used for UI only. You could try implementing UI without it but it will require more work. We will try to use only those interfaces to communicate within whole system. InventoryItems InventoryItem Strcture (Array) It will store all Items that are in Inventory. Inventory should implement IInventory interface! First lets add basics add and remove items from inventory functionalities. Create new function AddToInventory. Input Name: ItemToAdd. Input Type: Item Object Reference. Index Int It will store the index of the item in InventoryItems array if found the same item. FoundTheSameItem bool Used to determine if we found the same item in inventory. LocalItemToAdd Item Object Reference Just storing the input so it will easier to view the blueprint. Input Name: ItemToRemove. Input Type: Item Object Reference. Index Int It will store the index of the item in InventoryItems for ItemToRemove reference. Comments in screen should be enough. So this is basic Add / Remove functionality. Drop Item IInventory (Interface) Event. What this does is basically picking a location in front of the player (Owner, because Inventory will be attached to Player as component) and rotate it based on Rotation Phase. Rotation Phase will be increasing when dropping items from inventory. Now go to your event graph and add event from IInventory: Event Drop Item. That’s all in Inventory Blueprint for now! Next step is to add possibility to select an item in world and add it to inventory. It looks complicated but it isn’t. It’s just updating Text Values from the Item information, and checking if it’s Armor or Weapon to decide how custom text should look like. The first bool is used to determine if this widget is shown in Inventory UI (which we don’t have yet!) or game. HoverMaterial Material Reference Your custom Material. Reference to the Hover material. Just create some material and add reference here! NonHoverMaterial Material Reference This will store original item material. PhysicsInfluenceRadius float 15 Remember the Sphere component we have added earlier? This will determine the size of the Sphere. I’m saving original material and changing size of the Sphere. Simple as that. Simple as that – add selected item to inventory ping all item actors about physics and destroy item actor. UI_OnItemSelected UI_OnItemSelected Widget Reference Store reference of actually selected item. Add Inventory component and PhysicsHandle component. You can remove the hands mesh as it’s just cover the screen unnecessary. LastSelectedActor Actor Reference It will store selected actor in last frame. NewSelection bool Determine if there was new selection or not. MaxSelectionDistance float 250 Distance for picking up objects. WantToGrabItem bool Stores if we want to grab an item instead of adding it to inventory. ItemGrabbed bool Items is currently grabbed by player? DeltaTime float Current delta time. HitResult HitResult Stores hit result of our crosshair. It’s searching for IInventory items over the crosshair. Simple as that. I’m resetting the variables just in case here! Here’s where the magic comes. It’s searching for IInventory Actors and calling StartSelection / EndSelection if found new IInventory Actor. It will try to grab the item as well but we are missing one important part from the input. At this point you should be able to add the item to inventory and grab it when holding ‘E’ key. Now create new blueprint extending Actor named BP_ItemRecordingActor. Open it. Scene Component named MeshRoot and Static Mesh Component named Mesh attached to MeshRoot. DesiredExtend Vector 18,18,18 Desired size of the object on screen. CurrentMeshExtend Vector Current size of the object on screen. I would like to scale it do desired size. bRotateEnabled bool Is object currently rotated in inventory? OnStartRotateLocation Vector2D It will store 2D coordinates of the mouse when started to rotate the item from inventory. What I would like to accomplish here is to have a render target which will render my object to 2d texture. The problem is with assets different scale and pivots. Basically if you will be in pro game development your graphics team will create specific 3d items for your inventory. With the same pivot and scale – to fit the screen (Screen = Texture in this example) as good as possible. I’m not a graphics artist and I’m using meshes from packs. They have different scale and different pivots. My goal here is to have a system that will scale the items and move the pivot so I can render any object without thinking of the scale or pivot. Unreal is able to do that. It will be used when selecting items in inventory. And that’s all here. Now we need to spawn the actor somewhere. RecordingActorRef BP_ItemRecordingActor Reference It will store reference to the recording actor. Why I’m spawning it that far away? It need to be outside the sky sphere so we will get alpha in Render Texture. At this point functionality is there. Now we would need to implement Inventory UMG to show the inventory. It won’t be so easy as Skyrim Inventory is advanced. Create new Widget named UI_Inventory. Implement IInventoryInHUD Interface. For now leave it as it. CategoryType Item Category ENUM All Editable, Expose On Spawn. This will let know Inventory UI that category button was clicked. ItemToShown Inventory Item Struct Editable, Expose On Spawn. It will check how many of the same item do we have. It would be simpler to have OnHover event in Buttons. I have requested this feature on the Unreal Engine 4 Forums. For now we need to use Tick to determine that. Make sure Is Focusable is set to False. Just click on Root of the Hierarchy. It’s needed as I will use TAB key to open and close inventory. TAB is used to control UMG widgets as well. Setting this to false will disable TAB to focus. OnClickMousePos Vector2d It will store mouse position when clicked on Widget. ItemPreviewActorRef BP_ItemRecordingActor Reference Storing reference to Item Recording Actor. bIsHovered bool Store if Item is hovered currently. This is how I’m communicating with Recording Actor to rotate the Actor. This will be called when our mouse will leave whole widget. That’s all here! InventoryItems Inventory Item Struct ARRAY Storing all inventory items. ActualSelectedItem Inventory Item Struct Storing currently hovered item. CurrentOpenedCategory Item Category ENUM Storing currently opened category. ItemDropCount int Storing how much items did we drop when in inventory. I won’t be showing rest as it’s only changing Cast To – Specific Type. Try to fill the rest switch. I won’t be showing rest as it’s only changing the bool type and category type. You should figure this out. This will add “ALL” category button. It will search for all items and select if we have Weapon, Armor etc. I have directly set variable in Widget_ItemPreview you should use Function for that! I have separated it for 2 parts. 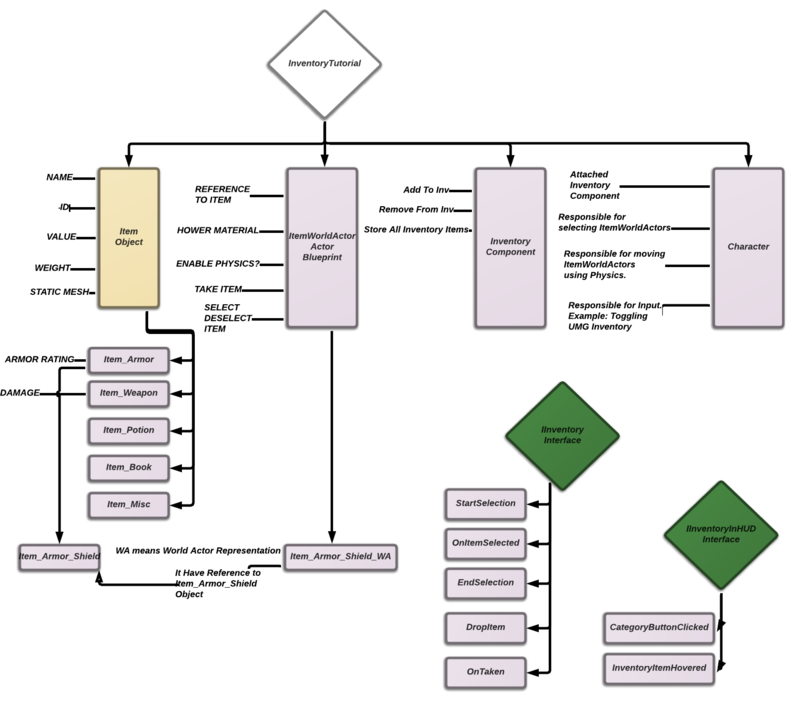 Yes – managing UMG in Blueprints is really hard.You can spend days to improve your Blueprints visibility. I assure you that this can be done much more easier. Just understand how it works and try to create it by yourself! Add one local variable named LocalKeyEvent extending from Key. Now we need to somehow open inventory. Open FirstPersonCharacter Blueprint and add UI_Inventory variable extending from UI_Inventory Reference. And that’s all. You have Skyrim like inventory completed! I have used Bumping Pub for showcase. The pack isn’t modular but it’s great for showcasing things! Shield has been found here and weapon here. You can found ready to use Inventory in Marketplace as well. I have done this for you for free and hope you will learn from it! Can someone please help me in the right direction here, im stuck at this point. — Just right click on ItemWorldActor and select “Create Blueprint Based on This Class” – this will create new blueprint for you based on ItemWorldActor. Just name it Item_Ingredient_Apple_WA. – When you open Item_Ingredient_Apple_WA you need to assign Item variable – this means your apple item object reference. I just figured out that i forgot to make the variables public! Thanks! We really appreciate your hard work! Your tutorials have helped me numerous times. Seeing someone else work on a project by them self really influences my friend and I when we are working on ours. In the ItemWorldActor in the construction script how do you link the Set ItemReference (Object Reference) with the Set Static Mesh… at the New Mesh Pin (Static Mesh Reference)… how does the (Target — World Mesh) appear? I think I got it but please explain just to be clear. Also how do you add an Inventory Component to the First Person Character? Great Tutorial – Wish you a happy New Year. Awesome but very tricky tutorial. I made some adjustment that I hope you will find helpful. First of all when you open the inventory while looking at an item you get the widget UI_OnItemSelected twice, as shown in the image below. What I did to overcome this is the following. 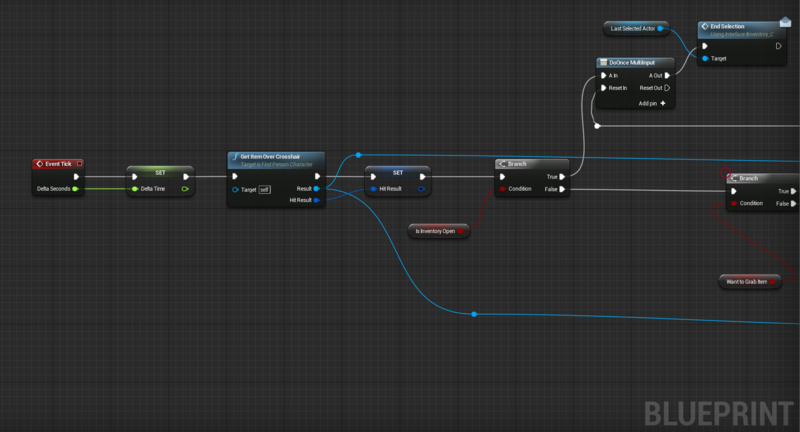 Go to your First Person Character blueprint and add the following variable. Go to the event InputActionInventory and update it to the picture below. Since the Player Controller always creates widgets, I felt there was no need to check if it was valid or not, plus it bugged out some other things I implemented. All in all it makes for some cleaner blueprint. Don’t forget to set the bIsInventoryOpen to TRUE at the end. Then go to the EventTick and update it as shown in the images. What we actually do is check if the inventory is open. 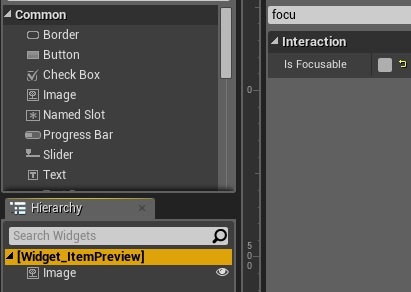 As soon as it is open, we remove the widget UI_OnItemSelected that was spawned when we looked at an object and we bring it back as soon as we close the Inventory by resetting the doOnce node. But for all this to work we have to do one last thing. Go to the UI_Inventory widget and update the Event InventoryKeyInput, by adding nodes as shown in the image. What we do here is basically setting the bIsInventoryOpen (from the FirstPersonCharacter) as FALSE, we state that whatever you trace is a new selection NewSelection TRUE (from the FirstPersonCharacter) in effect resetting the loop of the event GetItemOverCrosshair and finally we call the event GetItemOverCrosshair. Please! Tell me how you’ve figured the Inventory Component out! Please! Hello, can anybody help me out? 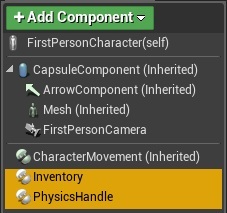 When I add my “inventory Component” to the first person character it only comes up as child actor and wont link to Inventory reference in “OnTaken” in the Inventory Interface. You created the inventory actor blueprint. There’s a blueprint called” Actor Component”. How did you end up doing this. I can’t figure it out. I am having some difficulties with picking up objects however and I have no idea what is going on, but I think it has to do with the PhysicsHandle. Whenever I pick up an object, it shoots away and is located much further away than it actually should and doesn’t really stay in the center as I would like it to. Do you happen to know why this is happening? Thanks again for the tutorial and keep up the good work! Try to check your mesh collision – maybe it’s to big or to complicated. In the first part of the tutorial I have linked great PhysicsHandle tutorial which can be used if you have issues! The Event InventoryKeyInput is the TabInput function. I renamed it since not everyone uses Tab to open the inventory.. I am having some trouble with the Inventory component reference. I have added one to the character blueprint using the add new blueprint script component (I am not sure if this is correct?). I then set the input of the IInterface ‘ontake’ to the same component (again unsure if this is correct). However, there is then a problem with the ontake event function described for the worldactor as the ‘add to inventory’ function is a separate blueprint (not the component). My main question is should my Inventory blueprint and the Inventory component be the same thing? And if so how is this done? I have tried adding the inventory blueprint as a component to the character but this does not seem to work properly. I hope this makes sense and that you can help! Add To inventory is function IN Inventory Component. Inventory Manager is Inventory component. Just what I needed to know! Thanks man and keep up the good work. I have another question! In the UI_Inventory event ‘UpdateData’ how do you connect the inventory reference to the set inventory with what looks like a get (but with a target)? When I try and connect the Inventory Reference (Component) and the InventoryItems (Inventory Item Struct Array) the two are not compatible, so it doesn’t work… Any ideas? Me again! I completed your tutorial and it works brilliantly (almost). Currently when I am opening my inventory the buttons come up correctly, including the category names etc. as do the names of the items. The widget preview also gets displayed, however, for some reason 1) the preview does not always show the object, 2) when the object is shown it experiences a weird distortion and 3) it shows the skylight as well as the object. After doing some debugging I’m still unsure as to why this is happening. The hover buttons are definitely working but there seem to be some cases where the cast (in order to write the correct text for the use/drop/etc.) doesn’t work. I discovered this by setting the final cast’s fail node to a “Cast Failed” and this appears several times. I also thought that perhaps the reason the widget is not showing the item is due to it falling as soon as it has spawned but I don’t think that this is the case (I tried setting simulate physics to off) but I may have missed something. Hopefully you may be able to answer me. 4. Make sure when spawning you have checked “Spawn Always” (or something like that) in your spawn actor options. I have recreated this from tutorial using clear project and it’s working. Debugging is really important part in game creation – place print strings and invest time to figure this out. I know that this isn’t any help from me but I can assure you you will learn much more without my help. However, I’m still having a problem with using the alpha of my render target texture. The actual texture has no alpha channel (well its a block white/black) and after doing some research it seems that the SceneCapture2D component doesn’t create an alpha channel? How have you done this? Create new level and put your RenderTarget to empty level – you will have alpha then :> Just test it out. When you have skybox you need to place your render target outside the skybox to get the alpha. Hay thank you so much however I am stuck at the grab item 02 picture as it is too low resolution to copy. I apologize in advance, I am still new to Blueprints. I am stuck on this part. I double checked, and I did everything up to this point correctly, but I assume that you are adding that event, to the event graph in the Inventory Blueprint? Problem is, I have searched high and low and I have no idea how to add an event from one blueprint to another. Just figured it out. Had to add IInventory to the Implemented Interfaces, in the Inventory Class Settings. 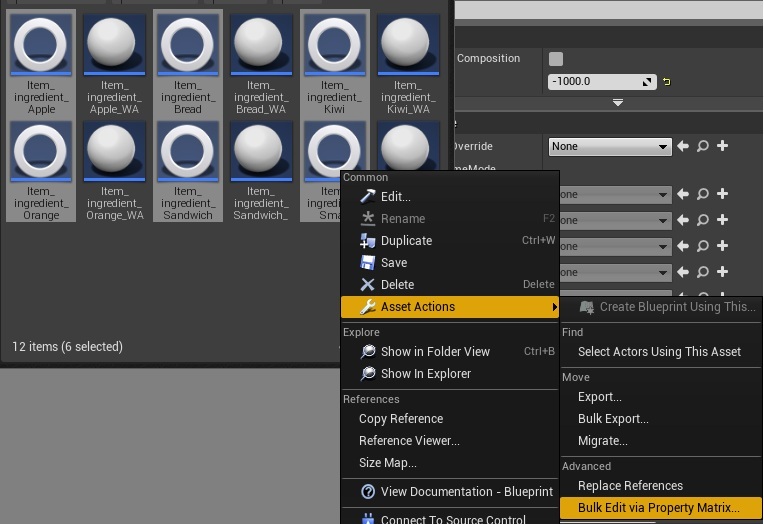 Search for UE4 Blueprint Interface at google. 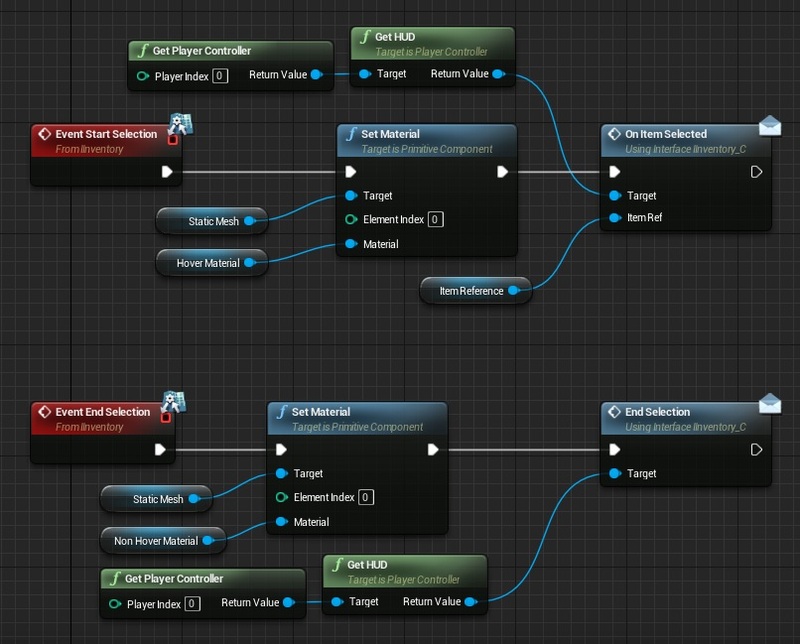 You need to add interface to your blueprint first. Thanks man! I’m adding this to my school assignment, but even doing this is a great learning experience. So, I am at the World Item Actor Update part of this tutorial. I set Non Hover Material, but when I try to plug in Get Material (Target is Primitive Component, it wont let me. It says, Material Interface Reference not compatible with Material Reference. Any ideas guys? Hi, Thank you for response and the hard work. Your second problem, is the same, variable type error. The problem is the Variable, In the past I put “Material > Reference” in NonHoverMaterial Variable, and HoverMaterial Variable… and this is not correct. Need to be: “Material Interface > Reference” en both variables. This fix the problem. In the Inventory Blueprint, the SpawnActor Item World Actor doesn’t have an item pin. Where can i find it? Thanks. -my widget Item preview accessed none. -UI Item Selected details accessed none. Great tutorial… No matter what distance I use for the screen capture, or if I create the screen capture in another level, there is not a legitimate alpha on the Screen Capture, and the 1-x into the opacity of the material for the 3d screen does not work. It makes the entire image invisible. Any suggestions or is this a 4.10 engine change issue? 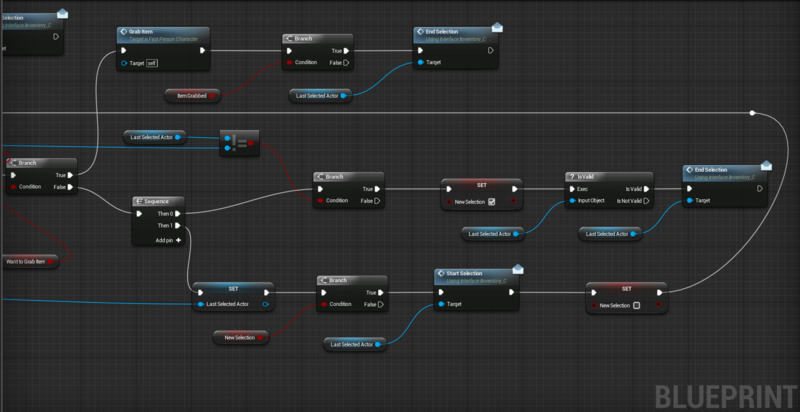 2- “Accesed None ‘ItemRef’ from node SetText (Text) in graph ‘EventGraph’ in blueprint UI_OnItemSeleted. Sometimes Unreal Engine crash too and need restart. I dont understand because I have the blueprints exactly as it appears in the images. the first error, if I break the link “UpdateData Custom event” with “Clear” (in UI_Inventory Blueprint), the error disappears, but the inventory is not displayed, and maintains the second error. I’m having the same issue, would it not likely be that the item ref doesn’t have a value? It’s just pulling it out off the variable charts and not giving it a “Reference”? OK. I thought id leave this here incase anyone else is trying to resolve this issue with “ItemRef” not containing anything and not do what I did which was spending 3/4 of a day ensuring I did everything correctly. 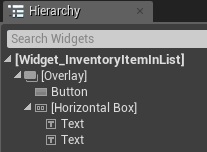 My error occured in the Widget_InventoryItemInList so may help, turns out in “UI_Inventory” on event CategoryButtonClicked I did not plug in ArrayElement from “ForEachLoop” to the ItemToBeShown from “CreateWidget”. Hope this helps and I urge others to read through the tutorial carefully and slowly as the creator has mentioned. And I have plugged in ArrayElement from “ForEachLoop” to the ItemToBeShown from “CreateWidget”. But the problem is stil there.. I have the exact same problem and i have plugged the arrayElement. What am I missing? Can’t seem to figure it out..
Never mind. Had to tick “Expose on Spawn” for the Inventory reference variable, in UI_Inventory. 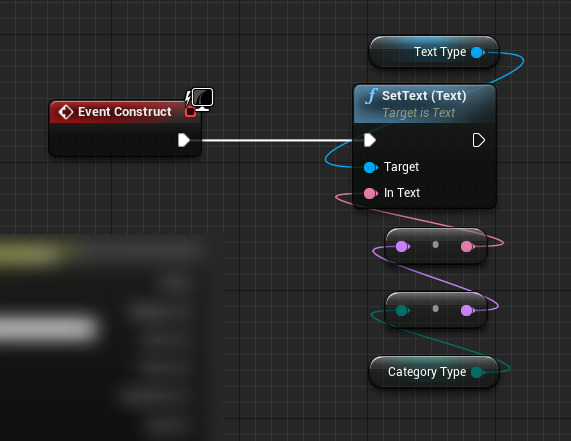 Hi I am also seeing the error for the text …….“Accessed None ‘ItemRef’ from node SetText (Text) in graph ‘EventGraph’ in blueprint UI_OnItemSeleted. Hi all, Kashif here… ANDRZE.. ANDRZE… ANDRZE… let me say this to you i followed both your long tutorials of Shooter Inventory and Skyrim inventory to the end.. i have to say is that your working too too hard NOT SMART. by that i mean in your tutorials you not adding TROUBLESHOOTING EVENTS along the way to make sure things actually work..They actually might work for you in the end but it does not work for people in the end.. why because along the way your not troubleshooting to see if things actually work the way they should as you said, so my advice to you is in your next tutorial please please please for the love of God add some troubleshooting events to see of things are working right. your working too too hard not smart. you want to work hard and smart at the same time., i am available at kkamal25@gmail.com to discuss this comment with you further. How to save this kind of inventory? I mean how to store and load references after re-opening the game? Finished the whole thing in 6 hours xD have a bit experience with blueprint but this took it to aonther level. And idk why it still stuck in Inventory when i TAB i click TAB again and it wont even fire off input action. Is there any chance that you could post the project files for the project? I followed through the entire tutorial, then there were some problems. I was debugging to try to fix them and now when i press play the editor crashes Even after undoing the changes that I made. Guys, i am in trouble on “If Item is Object how to add it to level?” on the script part, the error says “Error: Wrong class to spawn ‘/Game/FirstPersonBP/InventorySystem/Blueprint/Actors/MasterItems/BP_Item.BP_Item_C’ in Construct Object from Class” what do i do? My problem is pretty self explainitory once you see the picture: http://puu.sh/qdAWD/7b09b53d1b.png I have no idea how to get these two to connect, nor why they aren’t working in the first place. Can I get some help? Please disreguard my comment, the structure I was using was from another tutorial I was following. It was making an inventory structure, but I wasn’t at all happy with the result. I can’t get the command “GetHud” to work with the script. I thought at first that it was because I was using a thirdperson blueprint, but even after I switched to a firstperson blueprint with the first person HUD, I still get this Error: https://puu.sh/qdIG5/9c9730a312.jpg Can I get any help with this? And is there anyway to make this work with a Third Person Blueprint? I have the exact same issue ! Did you find a workaround ? Thank you so much for this tutorial!!! Works totally fine for me! I just have one silly question : why should we use Objects instead of Actors? Is it “Object Oriented Design” instead of “Actor Oriented Design”? I don’t have much coding background so please forgive me for this dummy question.. So to answer your question, object oriented design in terms of coding is not exactly what many may think. It doesn’t actually refer to an actual object, but rather a section of self-contained code. Many of the most popular and widely used coding languages are object oriented. Like Java, Python, C#, C++ and many others. My professor told me a good way to think about it is like if you’re repairing a car. There are many individual pieces that connect and interact in different ways to form a cohesive and functional unit. Some pieces serve numerous uses, or bridge several other parts, some can be used in different areas of the vehicle, and some only do one specific task. 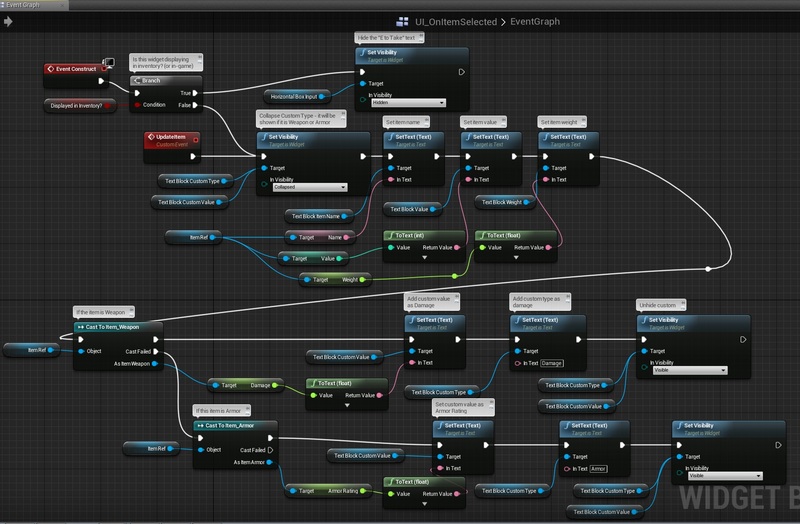 UE4 is also object-oriented, hence why blueprint nodes are a thing. this style of programming is what allows devs to reuse the same functions or references many times over. To answer the other part of your question. An object is simply a coded reference linking it to an actor. And Actors contain the actual 3d assets. I’m having this problem where no matter what my crosshair doesn’t interact with the world model. I’ve followed this tutorial through three times and I’m completely at a loss for what to do. There are no error messages, nothing to debug or anything. I place the world model and my cursor never picks it up. Any idea’s for where I might look for errors? I am having the same exact issue, The item cant be interacted with at all. Went through the tutorial multiple times and still no interaction for picking up items, also noted that if the inventory is empty and you click “all” the game errors out on the hud, No check for a empty inventory is cUsing the problem there. I noticed that i’m not the only one having this particular problem. Everything works fine but i cannot manage to close the inventory after i press tab. The game get stuck and i must restart! I know this is very old but I would like to get this working for learning material for college. 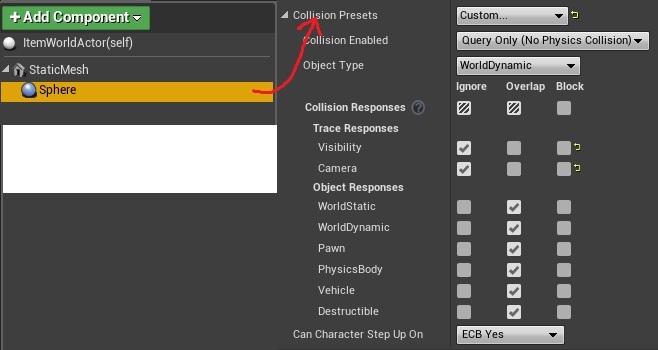 I’m getting error of accessed none on UI_OnitemSelected, also none of my world items are showing up anymore They were when I started the tutorial, but now they only show as the collision sphere. my email is Kohr_Ryan2876@yahoo.com if anyone could help. Hello, so for now I am stuck when trying to connect the “Get HUD” node to “On Item Selected”-“Target”. It tells me it can only be a “self reference”. What did I miss ? At the moment I followed the tutorial up to the point where the 3d item view will be added. I am on a Third Person project. For me the GetItemOverCrosshair function does not work. I used the ‘follow camera’ of my character instead of the mentioned one because it’s a third person game. But the result of the LineTraceByChannel is always false even if I’m ‘starring’ at an object that is an ItemWorldActor. Any help please? The image in 3D of the hovered item does not appears, any ideias how i can resolve that? I can’t get the items to actually add to the inventory. The code stops at the “isValid” block before onTaken. Even bypassing the isValid still doesn’t destroy the actor and add it. onTaken doesn’t start at all with simulation on. What could make the lastselectedactor not valid?? How do you equip weapons and armor to your character? Can anyone help me figure this out? How do you equip weapons and armor and make them fire? I can confirm, as is it can work in UE 4.15.1 I have everything working with item preview on transparent background and rotating, drop etc. This tutorial is correct, however as tutorial should be better explained with more screens. You have to check every stage many times for errors and some moves are confusing. For me, key problem was add inventory component to your character, because firstly I add actor inventory, not actor component invenotry – this is big difference of course. I cant get the inventory to close and its not showing the 3d perview. Good tutorial. I have one problem, i’m using 4.18, I can’t add items to my inventory. I can pick items up, but can’t add them to my inventory, my actor doesn’t get destroyed. Anyone who can help? Does anyone happen to have a working project they could share? I’ve run into quite a few issues and would love to debug.. Previous PostPrevious Project Management in Cloud for Indies?